PDB4 Passive Direct Box. The PDB4 is a four channel passive direct box that features four fully transformer isolated direct boxes in a 1U 19-inch rack mount chassis. The inputs and outputs of each of the four channels are isolated to maximize channel separation, and transformer isolation on each output helps to eliminate system ground loops. 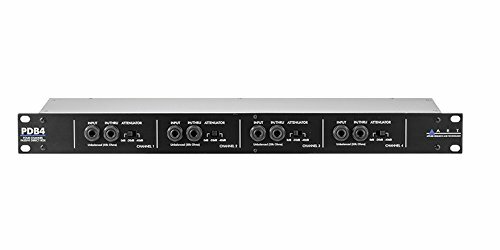 It is a rock solid, roadworthy interface that is ideal for connecting outputs of electronic musical instruments (or other audio sources) to the balanced inputs of mixer consoles and other balanced audio products. The PDB4 also allows connection of a music source to an instrument amplifier while simultaneously patching it to a mixer.